Secretary Of State Rex Tillerson Keeps Low Profile Since Taking Office : Parallels Questions are being raised about how much influence Tillerson has with the White House. He was absent from the president's recent meetings with the leaders of Canada, Israel and Japan. Secretary of State Rex Tillerson visited Germany last week and heads to Mexico this week, amid growing questions about how much influence he has in the White House. Rex Tillerson is heading on his second foreign trip as secretary of state later this week. But as in his visit last week to Germany, Tillerson is expected to try to keep a low profile when he travels to Mexico on Wednesday. Tillerson has said very little in public since taking office. There has been no State Department briefing since the Trump administration began a month ago. 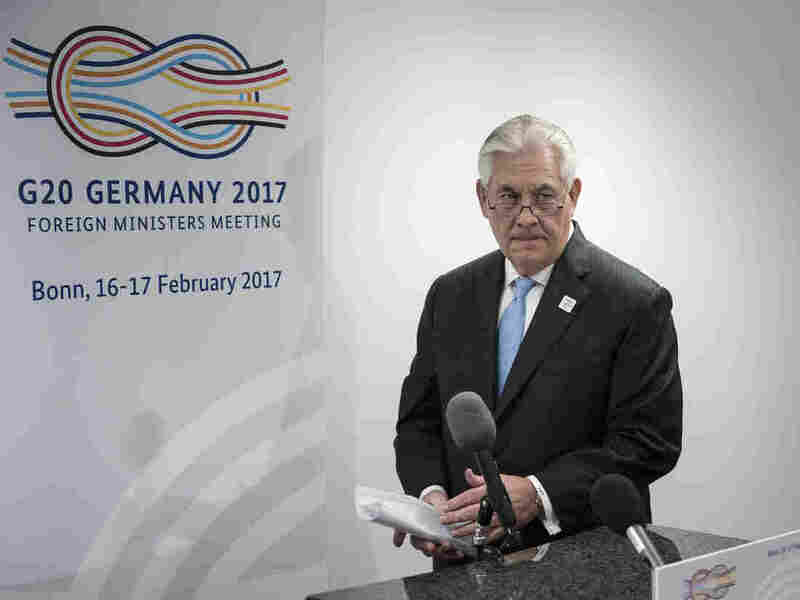 For two days at last week's G-20 meetings in Bonn, where Tillerson was meeting with his counterparts from the group of 20 leading economies, reporters tried but failed to get the secretary of state to weigh in on some of the key foreign policy issues facing the Trump administration. "Met a lot of new friends," Tillerson said with a laugh at a photo op. The former Exxon Mobil CEO is new to politics. His aides say he was mainly in listening mode on his first trip. He was also trying to reassure nervous allies in Europe about where the Trump administration is heading. Britain's foreign secretary, Boris Johnson, told his colleagues at a security conference in Munich that he is impressed so far by his U.S. counterpart. "Rex clearly understands and thought deeply about some of the conflicts that everybody is now looking to the U.S. to address, particularly Yemen, Libya, and of course Syria and Iraq," Johnson said. "I'm optimistic about this, folks, not least because I have no option." But some foreign diplomats are wondering just how much influence Tillerson actually has with the White House. The secretary of state was not part of Trump's recent meetings with the leaders of Canada, Israel and Japan. The White House hasn't approved a deputy for him yet, and many high-level State Department jobs have yet to be filled. That worries Tom Countryman, a former State Department official who served most recently as acting undersecretary for arms control and international security. "The very slow pace at which the White House seems to be paying attention to filling those vacancies is an indication, I fear, that the White House is content to have empty agencies across the government that cannot interfere with the edicts that are issued by the White House," Countryman says. Last month, Countryman was nudged out of his arms control job by the Trump administration, one of several senior foreign service officers effectively forced into retirement. Since then, the administration has moved to eliminate one of the State Department's deputy positions and the job of counselor, another holdover from the Obama administration. That kind of reshuffling is not unusual, says Brett Schaefer, who has written about reforming the State Department for the Heritage Foundation. "You've seen changes in the structure of the organization by pretty much every secretary that has come in," he says. "They've either established new positions or shifted boxes around to try to comport with their ideas of what a more efficient structure should be." The Obama administration hired many special envoys and expanded the State Department budget, Schaefer notes. "But what you haven't seen," he says of the Obama era, "is a sense that the State Department is functioning more efficiently in championing the foreign policy of the United States." Schaefer says Tillerson would like to move more quickly to get his team in place. Countryman, the retired diplomat, says that is key. "Diplomacy is not like other businesses," Countryman says. The U.S. needs a lot of high-level diplomats to interact with countries around the world, he says. "Even if they operate with a very small staff and a flexible set of responsibilities," Countryman says, "it gives you greater capability respond to allies and friends who need a high-level touch by the United States." This week, the Trump administration will be giving a high-level touch to Mexico. Tillerson will be joining Homeland Security Secretary John Kelly there. They'll be trying to put the relationship back on track after Trump's phone call with Mexican President Enrique Peña Nieto and his many statements demanding that Mexico pay for a border wall.